Emily-Marie is a 10-year-old girl who has struggled daily with severe Polyarticular Juvenile Rheumatoid Arthritis, since she was 14 months old. Everything from her neck down to her toes is affected. She doesn’t know anything other than being stiff and in pain on a daily basis. Though only ten years old, Emily-Marie has gone through countless pokes, blood work, MRI & CT scans, x-rays, ultra sounds, surgeries (carpal tunnel, multiple knee surgeries and more) and requires constant joint injections, monthly infusions and daily medication. In late November 2014, Emily-Marie fell while playing in the snow and, as her family, we never thought that our life would change. She was in constant pain and in March 2015 she had surgery to remove bone and cartilage that had broken off in her right knee. She did physio and recovered. Then, in May, the day after her 10th birthday, she fell while walking on a pool deck and fractured her femur in the same leg, which led to four weeks of a cast, followed by recovery and physio again. She missed three and a half months of school, but still weekly or as much as she could, she was at karate, crutches, cast, and all. She loves going to karate and still being able to participate and do as much as she could. Emily-Marie has never been able to join sports teams or do gym in school. While Emily-Marie is in the hospital for her infusions, The Heroes Circle volunteers have come to visit her and work with her. She loves when they visit. 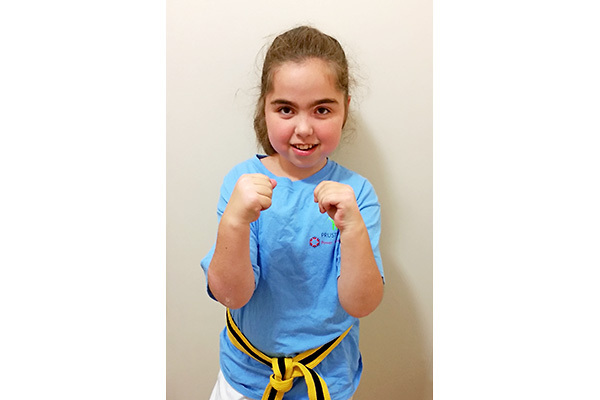 Every week, Emily-Marie looks forward to going and getting the chance to be herself and do karate at her own pace. Emily-Marie was extremely proud of herself when this past summer she did her first karate testing and received her yellow belt with a black stripe. The Heroes Circle program has given Emily-Marie the confidence in herself to be around others who know what being in pain, and not being able to do things at times, feels like. The Sensei’s who volunteer their time are amazing and know just what to do with the kids.